Amsterdam is a city that’s often visited by tourists, and people from all over the world come to take part in what the city has to offer, regardless of season. Amsterdam is the biggest city in The Netherlands, as well as its capital, and you’ll find plenty of activities to keep you busy during your stay. Here’s a list of 12 tips that’ll help you stay on top of all the things that the city offers when you’re planning your stay. In Amsterdam it’s very common to use a bike to get around and while you’re wandering around the city streets, you’re more than likely to see a ton of cyclists. Whether you’re on a larger road or an alley, you’ll see one or two bikes swishing by. There are great benefits to joining the biking Amsterdam locals as a tourist. With a bike in Amsterdam, you can move around efficiently and you’ll probably discover things you wouldn’t otherwise without a bike. Plus, it might be nice not to have to run up and down the subway or adjust to a collection of bus time tables. There are several places to rent a bike in the city. The best idea is to ask about it at the hotel or another tourist information location, like the train station. Amsterdam has a rich history and there’s a lot to experience as a historically interested tourist. A visit to The Amsterdam Museum might be worth it to get a comprehensive overview of the city’s history. 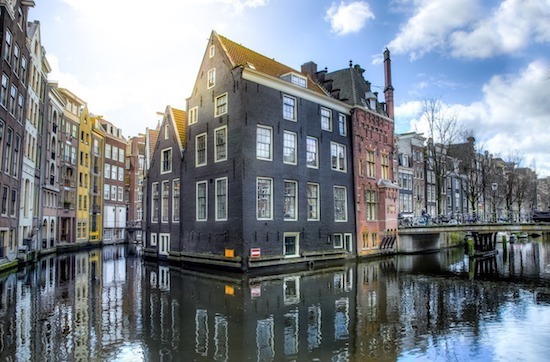 At this museum you can follow the urbanization of the city for several centuries and visit exhibitions to learn more about specific events in the Amsterdam’s history. 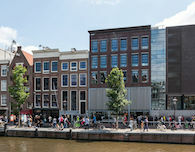 As a tourist in Amsterdam, you can learn a lot about the city’s Jewish history by visiting Joods Historisch Museum. This museum consists of four synagogues detailed with images, pictures and different objects that showcase the Jewish religion and culture in The Netherlands. Since the museum is located in the Jewish district, there’s a great opportunity to experience the Jewish culture out on the streets as well. If you’ve ever received a postcard from The Netherlands it might have had a picture of tulips or a windmill. These two symbols, together with Dutch handicraft, cheese and the ”klomp” clogs, are things you can see and learn more about as a tourist. There’s an enormous selection of tulips at Bloemenmarkt, which is an absolute must for those who want to buy Dutch tulips. If you’d like to see a typical Dutch windmill, you can visit De Gooyer, which is one of eight large windmills in Amsterdam. You can taste Dutch cheese at the Reypenaer Cheese Tasting Room, and if you’re interested in handicraft you can visit the Zaanse Schans Museum where you can see a ”klomp” (Dutch clog) or two. Amsterdam is almost like a labyrinth with its 165 water veins, and all the bridges create a special cityscape. You can relax from all the stress of the street in peace and quiet and just lean back on one of the city’s channel boats. To get around by boat in Amsterdam makes it very easy to get an idea of the cityscape and discover interesting details about the city that you can’t see from land. You simply step off the boat when you’re ready to get back out into the city, before returning to do some more sightseeing on the water. Possibly the most popular park in the city is Vondelpark, which is also called ”The oasis of Amsterdam”. Here you can wander around the greenbelts among beautiful flowers (tulips) and plants, or sit down on the grass to relax for a while. The whole atmosphere is very relaxing and is perfect for when you want a change of environment from Amsterdam’s central parts. At the park you’ll also find a playground for the kids, and if you’re in the mood for ice cream or something to eat, there are several cafeterias and restaurants. The easiest way to get here from the centre of Amsterdam city is by tram. Ziggo Dome is a large arena in central Amsterdam that annually hosts several different events that consist first and foremost of concerts and musical performances. Several big artists have played here and with room for 17,000 spectators, it’s usually very lively in the arena when world stars appear. There’s some sort of performance at Ziggo Dome every week and if you’re lucky during your stay in Amsterdam, you just might manage to squeeze one of the shows in. Tickets are often available, but not always. It’s usually sold out weeks in advance if it’s a main act. You can find what’s on in the schedule on Ziggo Dome’s website. Concertgebouw in Amsterdam is one of the most famous concert halls in the world. This is especially true when it comes to the acoustics, which are ranked top three in the world right after Boston’s Symphony Hall and Musikverein in Vienna. You can listen to numerous concerts at this amazing concert hall, especially those in classical music from world famous orchestras, but also jazz and pop. The concert schedule is constantly changing so you’ll have to check the schedule on the website or at the location. If you visit Amsterdam between June and September, you can listen to the lunch concert at Concertgebouw every Wednesday for free. The concert takes place at 12.30 and is a rehearsal for the upcoming performance. Most people have probably heard about the Jewish girl named Anne Frank, including her life and fate during World War II. Some have even read Anne Frank’s diary where you can follow her and her family’s life between June 1942 and August 1944 in detail, when they were hiding in Amsterdam from the Nazis during the Dutch occupation. The house where the family lived still stands today and it’s become a well-visited museum. The rooms in which the family lived are still there and as a visitor it’s not hard to be touched by the story and imagery of what it was like to experience the occupation. Despite it being small, everything is planned very well and visitors walk a specified tour to see all the different parts. Bringing your children is no problem, but little ones should avoid watching the unpleasant films that are shown. Also make sure that you haven’t booked anything else in right afterwards as the lines to get in can be long. It’s a good idea to be there early in the morning. If you like to play mini golf, you definitely shouldn’t miss a visit to GlowGolf Amsterdam. You’ll definitely have a different mini golf experience at this place, to say the least. The courses are inside and the entire premise is made in a 3D environment with luminescent details and UV lights that light up everything that’s white. Even though it costs a little bit extra, you shouldn’t miss wearing 3D glasses while playing. The 3D glasses enhance the experience and also make everyone look funny. There are fifteen holes to play in total and everyone is welcome, regardless of age. There’s a restaurant and café on the top floor for those who’d like to stay to eat or grab a cup of coffee. A place that has just opened up in Amsterdam is Postcard Experience, where you go to get a digital postcard of your own design created. The process starts with you being filmed in front of a so called ”green screen” and taking directions on how to act. Afterwards, a film is produced where you go through Amsterdam or The Netherlands in a little ”clog car”. It’s similar to a personal postcard in moving format, which is very fun to look at. Instead of sending a traditional postcard, this is a cool alternative to email your acquaintances or to share with Facebook friends. Even if you’re not an art enthusiast, a visit to the Van Gogh museum might prove to be very interesting. Van Gogh is one of the greatest painters in history and most people are fascinated by his different paintings and pieces. The museum was opened in 1973 and today has the largest collection of Van Gogh paintings. In addition to this, you’ll also find paintings from other artists who were active at the same time as the world renowned painter.